I've been baking quite a bit lately because there have been occasions. Babies born, parties attended, visitors we're waiting to host. Occasions always enlivened by baked goods. 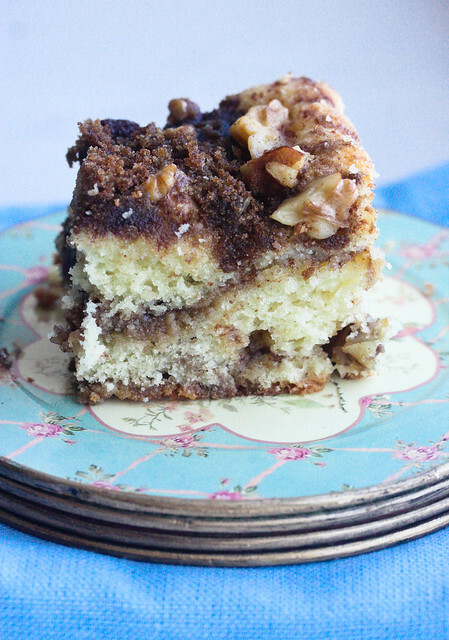 Also, it isn't a bad idea to have an incredibly rich, buttery, sour-creamy coffee cake in your repertoire. A recipe people will most likely want you to write down for them, or at least make again. The kind that fills your house or, in my case, small apartment with aromas of cinnamon and walnuts roasting. Plus, even though I declared winter officially over a few days ago, the weather gods, or whoever is in charge of things, aren't listening to me. And we're back to expecting 'wintry mixes' and rainfall and degrees bellow freezing. Damn it. I may be partly to blame for bragging about a recent 75 degree day on Facebook for the express purpose of sticking it to my friends and family back in Colorado, who are usually the ones bragging about weather. Double damn it. 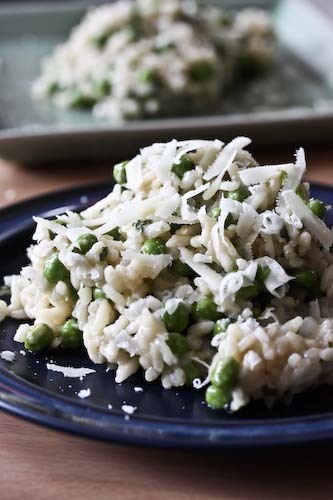 The recipe comes from an oddly shaped volume called Recipes from Home by David Page and Barbara Shinn. Too narrow and too thick to stay open on the counter, I can recommend canned goods as paperweights to keep the pages open. Makes you wonder if perhaps some people don't actually use the products they design. For example, the fact that two of our three small closets aren't even deep enough for hangers to fit into. I mean, someone was paid to design this apartment, right? Anyway, I'm forgiving the authors for the shape of their book because they gave me my go-to coffee cake. And because they were probably no more responsible for it than I am for my ridiculous closets. Page and Shinn started the NYC Home Restaurant in 1993, and it's billed as a farm to table restaurant in Greenwich Village. I'll admit that I've never been, but since we have a guest coming next weekend, a guest from not-America, a place known for its seasonal American food sounds pretty perfect. 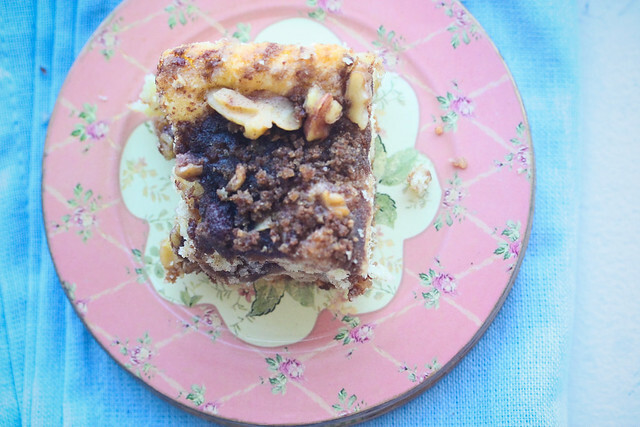 But in any case, if you've been looking for a tender, delectable sour cream coffee cake, you can stop now. Because this one is not at all difficult, and it is positively addicting. Oven preheated to 325F, grease a 9x13" baking pan, such as a pyrex. Page and Shinn call for a 12x9x2" pan, but all I had was the classic pyrex, so I reduced the baking time from the called-for 50 minutes to 40 minutes and it was perfect. Set the pan aside. In a medium mixing bowl, sift together the flour, baking powder, baking soda, nutmeg and salt. In a separate small bowl, combine the sugar, cinnamon and nuts and just mix it together with your hands. That's the easiest. In the bowl of a stand mixer, or with a hand mixer, cream the butter and sugar together until pale and fluffy. Beat in the vanilla, then the eggs one at a time. Beat well between each egg. Beat in the sour cream, then turn the mixer down to low speed and mix in the flour gradually. Stir just until combined. The dough will be quite firm and somewhat elastic, so I found the best way to deal with getting it into the pan is by hand. Spoon 1/3 of the dough into the baking pan and spread it by hand so that it covers the bottom of the pan. It will be a somewhat thin layer. Sprinkle 1/3 of the sugar mixture over the top, then spread another 1/3 of the dough over the sugar layer. Again, it's easiest just to kind of stretch it and pull it by hand. Sprinkle another 1/3 of the sugar, and then add the last of the dough, continuing in the same manner. Finish with the final 1/3 of the sugar mixture sprinkled over the top. Bake for about 40 minutes, until the cake passes the toothpick text. Cook for about 10 minutes, then serve warm or cooled to room temperature. Gah, I hate those kind of cookbooks! I mean, I OWN those types of cookbooks and I still buy them, but that doesn't mean I don't curse them when I lose my place because the pages won't stay open. I've been looking for a good sour cream coffee recipe for ages. I can tell from these stunning photos that my search is over. This cake looks divine. Thank you!